The emergency meeting of presiding officers of state Legislatures convened here tomorrow by Lok Sabha Speaker Somnath Chatterjee to discuss the relationship between the Legislature and the Judiciary has suffered a setback with the Opposition NDA alliance advising Speakers of state Assemblies to abstain on the ground that it can be harmful to the democracy. The Tamil Nadu police came under severe criticism from a judge of the Madras High Court for its manner of investigation into the Sankararaman murder case in which the Kanchi Shankaracharya and his junior have been chargesheeted. Eminent Tamil writer and film maker, D. Jayakanthan, was today awarded the prestigious Jnanpith award for the year 2002 in recognition of his outstanding contribution to the Indian literature. The National Board for Wildlife has endorsed constitution of a task force for trans-boundary protected areas in the interest of better conservation planning and effective control on poaching and illegal trade. Amid intensified turf war between various factions of the Congress in Kerala, former state Chief Minister K. Karunakaran today met party President Sonia Gandhi but refused to withdraw the rally of his “group” on March 21. The BJP today said Gujarat Chief Minister Narendra Modi, whose visa has been revoked by the US, would address via satellite his scheduled meeting at Madison Square Garden in New York tomorrow. The BJP today deplored Washington’s denial of a diplomatic visa to Gujarat Chief Minister Narendra Modi, terming it as “diplomatic discourtesy” and held the pseudo-secular parties for the “denouement”. Begum Zareen Musharraf will not visit Lucknow due to health reasons, her nephew Sidrat Ansari said over the phone this evening. Mr Tarlochan Singh (Independent) today urged the government to review cases relating to terrorism, “where innocent persons” were behind the bars. Punjab Chief Minister Capt Amarinder Singh may have succeeded in bringing back some Punjabi youths detained in Pakistan jails but Lok Sabha members today expressed concern over the remaining youths whose detention terms had come to an end. The UPA delegation from Jharkhand led by JMM chief Shibu Soren today met Congress president Sonia Gandhi to press for the dismissal of the NDA government in the state and a CBI probe into the alleged horse-trade. Film actor Vivek Oberoi is among the winners of the 13th Red and White Bravery Awards, Maharashtra. Rajya Sabha Chairman Bhairon Singh Shekhawat has accepted resignation of Mr Sanjay Nirupam from the House. The police here arrested six persons, including a college principal, in connection with the leakage of the physics paper in the ongoing high school examinations of the UP board here, official sources said. Women in Patna take out a car rally for peace. Synthetic colours flood markets ahead of Holi. Fun lands producers in trouble. Mr Chatterjee has, however, decided to go ahead with the meeting with one change in the agenda following the Congress-led UPA government’s decision not to seek a Presidential Reference under Article 143 following the Supreme Court’s intervention in advancing the date for the vote of confidence in the Jharkhand Assembly when JMM leader Shibu Soren had been invited by state Governor Syed Sibtey Razi to form the government and granted 20 days time to prove his majority on the floor of the House. That situation has since been corrected with Mr Razi accepting Mr Soren’s resignation and inviting the NDA to form the government in Jharkhand with Chief Minister Arjun Munda comfortably proving his majority in the Assembly. In the wake of the apex court’s intervention, the perturbed Lok Sabha Speaker had underlined the need for restoring what he described as the “Constitutional Balance” among the Executive, the Judiciary and the Legislature. He wasted no time in convening a meeting of the Speakers of state Legislatures in discussing this issue which was stoutly opposed by the BJP-led NDA. The Lok Sabha Secretariat in sending out the invitations drew pointed attention to an “Emergent Conference of presiding officers of Legislative bodies in India to discuss the relationship between the Legislature and the Judiciary in the context of recent developments” being held in the Parliament House annexe here on March 20. Significantly, the Executive has been kept out of the one-point agenda at the conference. Further, the invitation notes that “this may please be placed before the Deputy Chairman, Rajya Sabha, and the Secretary-General, Rajya Sabha, with the request that they may kindly make it convenient to attend. As the Chairman of the conference, Mr Chatterjee will set the tone in his opening address followed by the various Assembly Speakers of UPA-ruled states expressing their viewpoints and opinion. The curtain rings down on the three-and-a-half hour conference with the Lok Sabha Speaker addressing a press conference and hosting a lunch for the Speakers of state Legislatures. Interestingly, the Congress at a high-power meeting before all-party meeting convened by Mr Chatterjee on March 10 had felt that a Presidential Reference should be made. This issue was put before Prime Minister Manmohan Singh and UPA Chairperson and Congress President Sonia Gandhi where Home minister Shivraj Patil and Law Minister H. R. Bhardwaj, among others, were present. It was decided that making a Presidential Reference would only compound matters and smack of a confrontationist approach. The overbearing view in the higher echelons of the Congress is that the Supreme Court is unlikely to review its own decision on the Jharkhand issue. In any case why should the apex court do so as its order advancing Mr Soren’s vote of confidence was not an interference in the functioning of the Legislature. The Prime Minister took the initiative in clearing the air of any misgivings by calling on Mr Chatterjee and emphasising there are no differences or rift between the government and the Speaker. On his part, Mr Chatterjee affirmed there is no confrontation between the government and the supreme legislative body in the country. He explained that the consensus at the all-party meeting minus the BJP was to suggest to the Executive to make a Presidential Reference. As it was not for the Lok Sabha Speaker to make the Presidential Reference, it was for the Manmohan Singh government to decide one way or the other. In the absence of Vice-President and Rajya Sabha Chairman Bhairon Singh Shekhawat, Lok Sabha Deputy Speaker Charanjit Singh Atwal and the presiding officers of state Legislature where the NDA is at the helm of affairs, the conference summoned at a short notice by the Speaker can at best be a futile academic exercise. Mr Justice K.P. Sivasubramaniam of the Madras High Court has bombarded the special investigating team (SIT) and described its investigation into the murder case as “fishing expedition tactics”. The Judge was seriously thinking of not hearing any more the case related to the Shankara Mutt at Kancheepuram. He said none of the actions of the SIT could be sustained and to the surprise of the lawyers remarked he was contemplating to opt out of the mutt cases and suggested that they be heard by some other judge. Mr Justice Sivasubramanium made these comments while hearing a writ petition seeking quashing of the SIT’s summons to Dr S. Bhaskaran, a Chennai-based cardiologist attached to the famous eye hospital ‘Sankara Nethralaya’ here. Through a website — Kanchi-Sathya.org — Dr Bhaskaran had started a ‘Campaign for Dharma’ and appealed to the devotees to donate liberally for meeting the legal expenses of the mutt regarding the cases against the two acharyas and other officials. He asked whether the SIT was “engaged in a fishing expedition” and directed the prosecution to advise their client to stick to the case instead of branching out in various directions. Meanwhile, on behalf of Tamil Nadu Chief Minister J. Jayalalithaa, a criminal defamation suit has been filed in the city Civil Court. According to the suit filed by the city Public Prosecutor Mr T.V. Ganesh, Mr Joshi, who met the seer at the Vellore Central Prison on November 14 last year, made certain comments against the state government regarding the arrest. The 70-year-old author has to his credit 40 novels, 200 short stories and 15 collection of essays. He was chosen by the Jnanpith Selection Board headed by eminent jurist Dr L. M. Singhvi. The award carries a cash reward of Rs 500,000, a citation plaque and a bronze statue of Vajdevi. The 10-member jury, comprising eminent writers Mahashweta Devi and U.R. Ananthamurthy and Sahitya Akademi President Gopi Chand Narang, praised Jayakanthan for enriching the high literary traditions of the Tamil language. "His literature represents deep and sensitive understanding of the complex human nature and is an authentic and vivid index of Indian reality," the citation said. Announcing the award after the meeting of the selection board here today, Dr Singhvi said the works of Jayakanthan "unveils every depth of human emotions and equations". "It is a moment of great pride for the Bharatiya Jnanpith to choose D. Jayankanthan for the Jnanpith Award for the year 2002," he said. Born in a middle-class family at Cuddalore in 1934, Jayakanthan is the second Tamil writer to win the Jnanpith Award. In 1975, P. V. Akhilondam won the 11th Jnanpith Award for `Cittirappavai'. About 10 of his literary works have been made into films so far since he ventured into the celluloid world in 1964. His Tamil translation of Romain Rolland's biography of Mahatma Gandhi won wide acclaim from the Tamil readers. Some of his works have been translated into major Indian languages and also into English, Russian, German and Japanese. The board endorsed the proposal of the Ministry of Environment and Forests at a meeting chaired by the Prime Minister, Dr Manmohan Singh, here on Thursday. The task force would identify two natural eco systems in nondisputed and non-sensitive areas along international borders. Besides, it would obtain approval of the Ministry of Defence, Ministry of External Affairs and Ministry of Home Affairs. It would be expected to hold meetings with the departments concerned and ministries of neighbouring countries for their concurrence and sign memorandum of understanding (MoU) with neighbouring countries for establishing the trans-border protected areas. The task force, to be chaired by the Secretary, Ministry of Environment and Forests, would submit its report once every year with signed MoU to the National Board of Wildlife. Mr Karunakaran said he could not put off the rally, which was the last of the three rallies planned by his group against the party directive, as it would affect his workers’ confidence in him. Taking exception to the rallies, the Congress had suspended former KPCC chief Muraleedharan, son of Mr Karunakaran. While two rallies have already been held, the third is scheduled for March 21. Mr Karunakaran said the rally was for “Congress men” to revitalise the organisation. The octogeniarian leader said he would continue to criticise the Congress-led government in the state, if it went wrong. He also sought to put a lid on the issue of Mr Muraleedharan calling senior party leader Ahmed Patel as “Aluminium Patel”, saying the episode was over. “Mr Modi may be denied visa. He cannot go there. But the function will not be cancelled. Mr Modi will speak. He will address Indians there from Gandhinagar via satellite,” BJP general secretary Ananth Kumar told mediapersons here today. “They can cancel Mr Modi’s visa, but can’t stop him from addressing the meeting via satellite,” he said. The decision was taken at a meeting of BJP Chief Ministers and senior leaders of the party here. With a view to making the party stand more credible, a resolution, adopted at the meeting of the five BJP-ruled Chief Ministers convened to discuss the introduction of the value added tax, held the US guilty of “embittering the relations between the friendly people of India and America”. “The action is a slur on our Constitution, legal systems, democracy and the entire Indian diaspora worldwide. Modi is the head of a democratically elected government of a state in India. Denying him Visa is an act of diplomatic discourtesy of an unprecedented and most indefensible kind”, the resolution said. “There can be no place for such insolence in the relationship between any two countries, least of all between two democracies”, a resolution stressed and added that “India will resolve all internal issues internally and accepts neither international referees nor review”. “The USA is not an international guardian or the sole repository of human rights, morality or freedom of faith”, it said, while praising the government’s protest against the move. 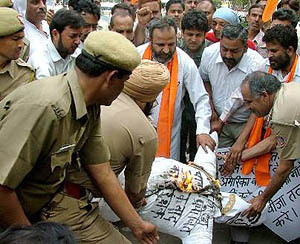 Recalling the 1984 anti-Sikh riots, it said, “however, no one ever sought to use the killings to tarnish the reputation of the then ruling party at international fora, as has been done in the case of Gujarat”. Mr Ansari could not hide his disappointment but added stoically, “What will be, will be”. Apprehensive of meeting the other two guests — President Musharraf”s brother Javed and son Bilal — Mr Ansari said he would be meeting them for the first time and hoped all went well. An educationist, Mr Ansari and Pakistani President Pervez Musharraf are second cousins. The Pakistan guests are expected to arrive by the morning flight IC 600 informed the ADM, Protocal, Mr Vindo Kumar Rai. They would stay at Hotel Raj Residency. During the daylong visit they are expected to visit the imambaras, the Residency and the Picture Gallery. Raising the issue during Special Mentions in the Rajya Sabha, he said everyone was shocked when Kanishka fell in the sea of Ireland in 1985. He said the Canadian court that was inquiring into the case for the past 20 years had acquitted the alleged accused who were Sikhs. “The court found they were not guilty and they were not involved in any conspiracy. It has been proved that no Sikh organisation can do any such heinous crime,” he said. He said it was unfortunate that hundreds of the Sikh youths were wrongly named as terrorists and eliminated in false encounters. He said the government should review cases “where innocent persons were behind the bar and suffering at the hands of the police”. Joining the members, Speaker Somnath Chatterjee said: “I am sure the government will take note of it”. The issue was raised by BJP MP from Punjab Avinash Rai Khanna as a matter of public importance. He said: “About 100 Punjabi youths were handed over to the Pakistan police by the Iranian Government. The Pakistan police had filed cases under the Foreigners’ Act and they were convicted”. Mr Soren later said they told Ms Gandhi of the manner in which the Arjun Munda government came into being. Answering queries, Mr Soren said Ms Gandhi, who is also UPA Chairperson, heard them patiently and asked the UPA leaders to keep a strict watch on the functioning of the state government. Senior Congress leader and Union Minister Subodh Kant and former Deputy Chief Minister Stephen Marandi were also a part of the delegation. Announcing the names of the awardees at a press conference today, Mr Surinder Seru, chief executive officer of Godfrey Phillips India, organiser of the awards, said the objective of the awards was to inculcate a culture of selfless action among Indians and publicise the extraordinary, yet little known acts of physical valour, social service and humanitarian deeds. The awards would be presented in two categories — Physical bravery and Social Acts of Courage. In each category, the winners would be awarded gold, silver and bronze medals, along with cash awards of Rs 20,000, Rs 15,000 and Rs 10,000 and merit certificates, he added. The chairman said he received a letter of resignation from Mr Sanjay Nirupam which had been accepted with effect from March 18. Mr Nirupam had resigned from the Shiv Sena recently following differences with the party leadership over raising issue of allocation of Reliance Infocomm shares to "fake" companies allegedly owned by businessmen close to BJP leader Pramod Mahajan. According to district magistrate Ramendra Tripathi, four of those arrested have been listed in the Gangsters Act for the leakage of the Physics-I question paper which was being circulated outside the examination centre before the start of the exam yesterday. The Principal of the college, who was named in the FIR for negligence, was also taken into custody, officials sources said.